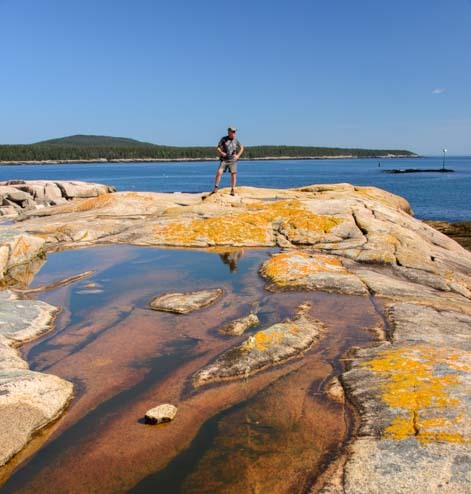 Schoodic National Scenic Byway - Downeast Maine at its best! 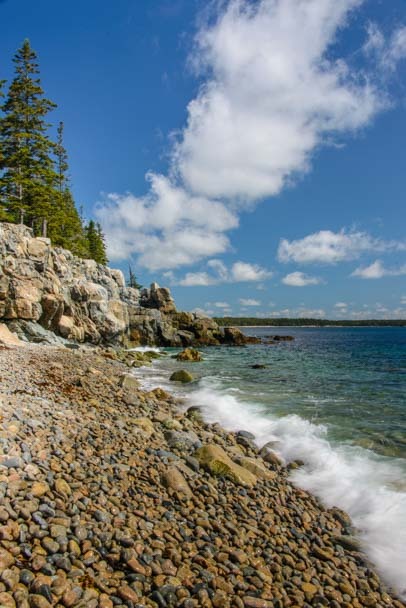 Schoodic National Scenic Byway – Downeast Maine at its best! June 2015 – While we were in one of the Maine visitors centers getting info about Mt. 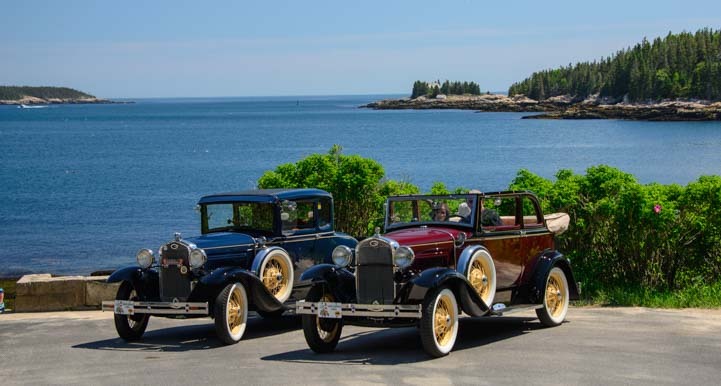 Desert Island and Acadia National Park, I noticed a tiny brochure entitled, “Schoodic National Scenic Byway.” We love scenic drives, and any drive that has been designated as a National Scenic Byway is always really outstanding. I tucked that little pamphlet into my stack of literature with a happy smile, and one sunny morning we took off on what turned out to be a truly inspiring tour. 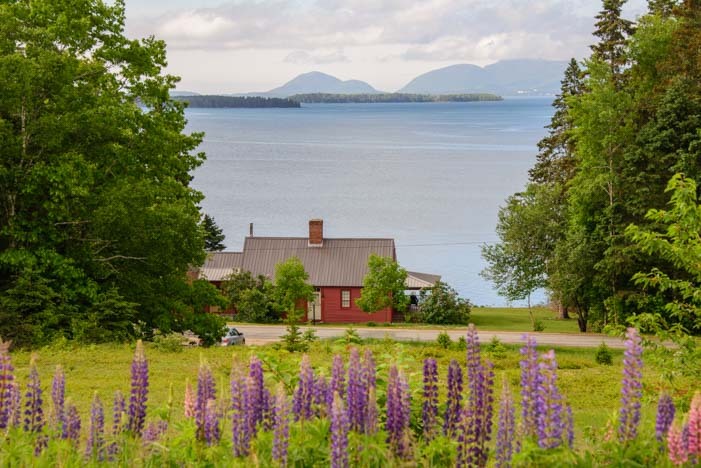 This short drive takes in some of the best scenery that northern Maine has to offer, and what’s even better is that we saw almost no other tourists all day long. This was quite a contrast to Acadia National Park and all of Mt. Desert Island which were teeming with visitors. We were loving the raw and rugged coastline that we found in this part of Maine, and at one point we stopped to watch the waves crashing on the granite boulders. 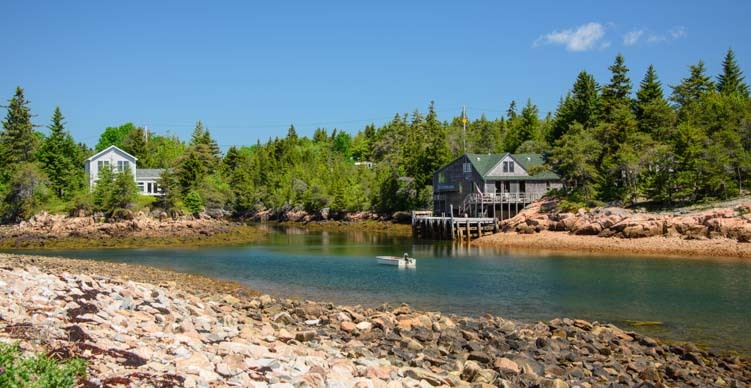 At the tiny hamlet of Wonsqueak Harbor we found a gem of a little cove and stopped for pics. The water was wonderfully calm in the many bays that we passed, and it was crystal clear. 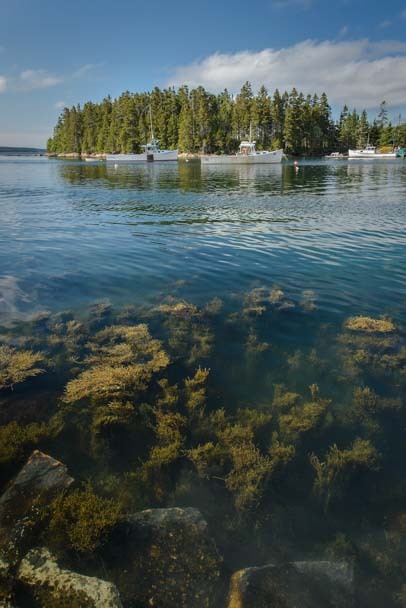 It was so clear in Winter Harbor that Mark got an awesome photo of the swaying seaweed beneath the water with a classic pine covered shore in the distance. Above and below — talk about clear water! Acadia National Park has a little branch on Schoodic Point that is isolated from the rest of the park over on Mt. Desert Island, and as we passed through the heavily wooded shoreline, we were engulfed in the most delicious smell of pine. I don’t know if it was the damp morning air or what, but we breathed deeply and felt so refreshed. Mark later bought a bag of crushed Balsam Fir needles so we could enjoy it in the rig wherever we parked! Passing the tip of Schoodic Point, we came to the most engaging part of the tour: Prospect Harbor. 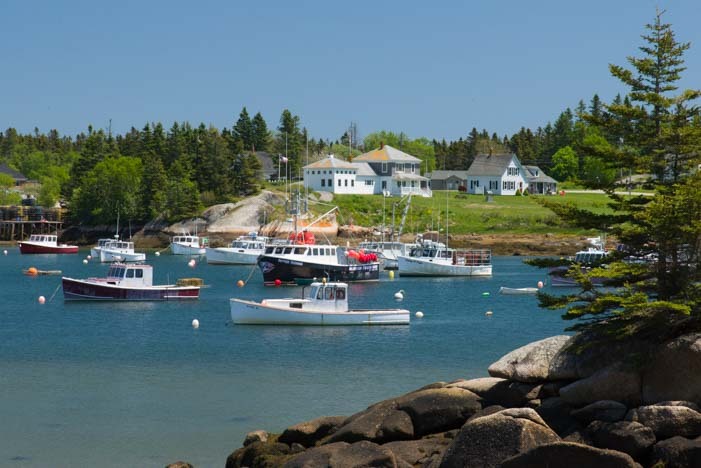 This harbor oozes downeast Maine charm. 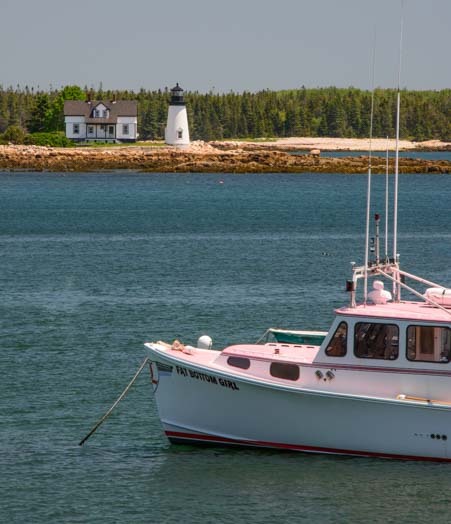 It is filled with lobster boats, and on the far shore you can see Prospect Head Light. Nearby we found some wild irises growing by a small pond. What are these doing here? How pretty! Next to those were some wild lupines. Pink, purple and blue wild lupines were everywhere! 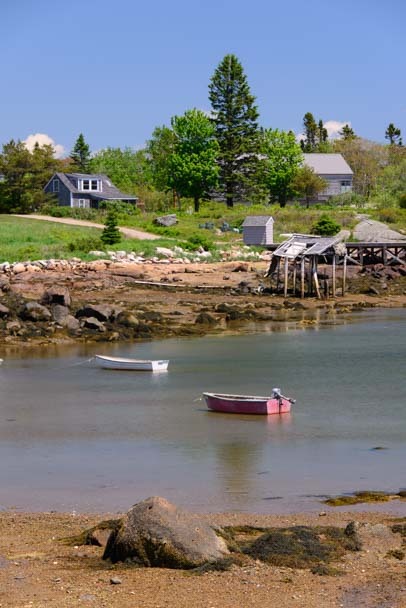 But it was the pretty Maine scenery of the waterfront communities that really caught our eye. The tides are big here, so there are tall ladders that go from the docks down to the water. Classic Maine lobster dock with traps stacked six high. Out in the water, dinghies waited patiently for their owners to return from a day of lobstering. What we loved about this area is that it is very real and not a fake put-on like so many seaside villages that are decorated with cutesie lobsters, bouys and traps. 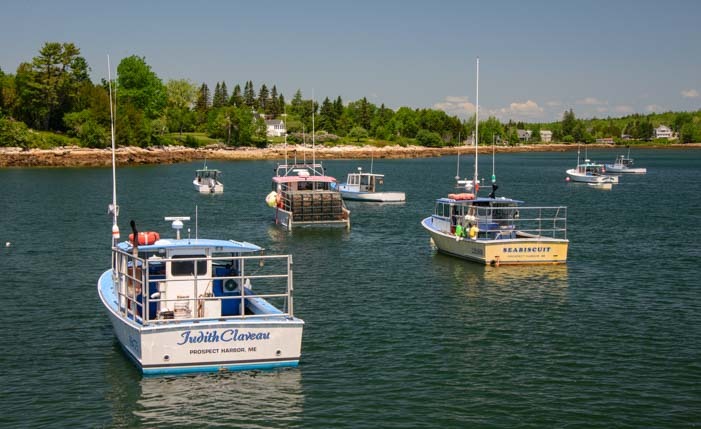 This whole region is a true working community of active lobstermen. Evidence of the lobster trade was everywhere. 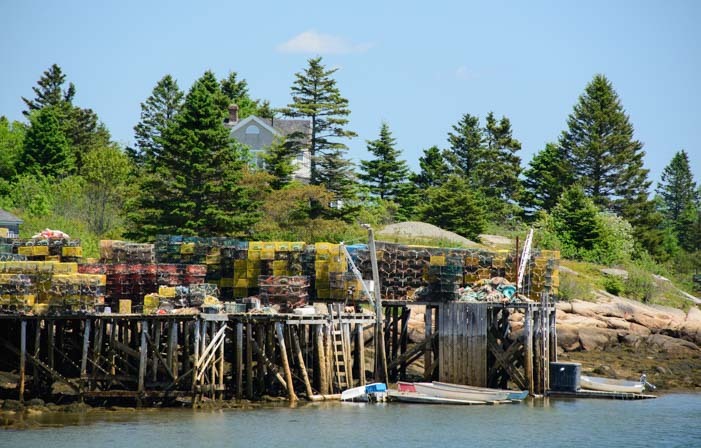 We saw lobster pots stacked high all over the place. These aren’t props, but they do make for great photos! The lobster boats in the harbor sat peacefully in the morning sun. Scenic quaintness aside, this is a working harbor. 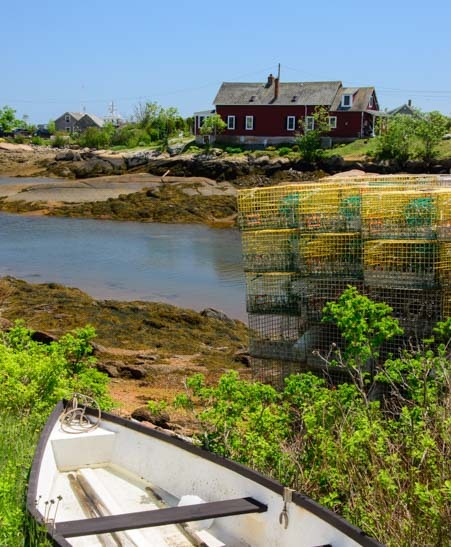 Most of the homes in the area are owned by working lobstermen, and we passed one house after another that had a huge stack of lobster pots in a side yard or even in the driveway. On top of the stack would be a neatly coiled pile of rope and a big collection of identical bouys strung together. After seeing so many seaside towns that use old bouys with all different color schemes and patterns as colorful ornaments, I was fascinated as we passed one house after another, each with its own colored bouys adorning a neat stack of pots. One house had all white bouys with a blue stripe. The next had all orange bouys with a white stripe. And so on. I was so caught up in musings about these folks and their lifestyle that I totally forgot to take any photos! This stuff was real. I loved it! Down on the wharfs and the docks, things were a little more chaotic. Little coils of rope were all over the place, and a scramble of different bouys was scattered about. 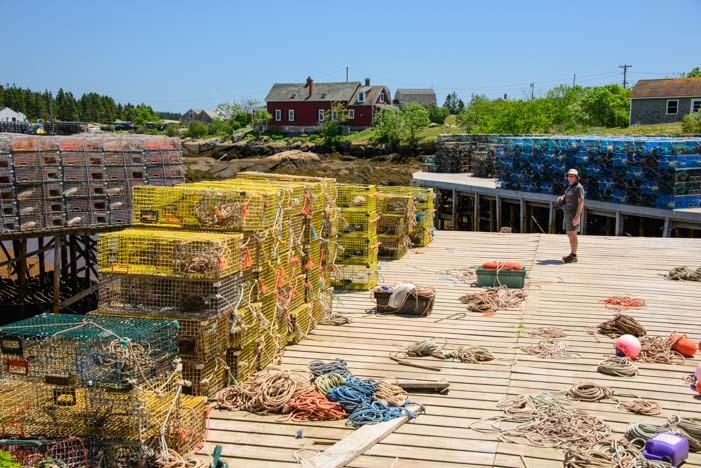 Coiled rope, lobster pots and bouys on the dock at Prospect Harbor. 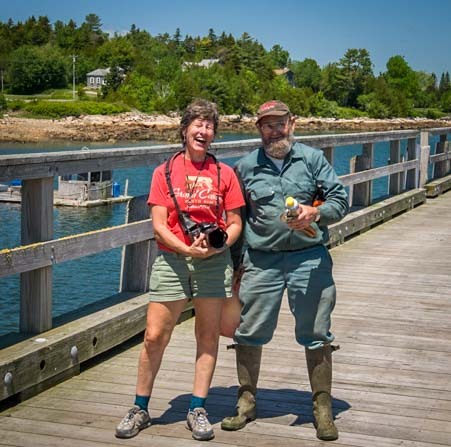 We wandered around the docks and watched a lobsterman with a big bushy beard coming up from his boat at a brisk pace. His step was nimble and quick, and his smile was big and warm. Now that is the real deal. My own great-grandfather was a lobsterman, and counting out the years, I realized both his grandfather and my great-grandfather would have been out on the sea working their trade in the same era in the early 1900’s. We laughed that both of our ancestors had used boats powered only by oars and sails. We meet a true Maine lobsterman who’s been at it for 75 years. As he drove off in his pickup, he didn’t tip-toe away. He peeled out and squealed the tires! I hope we live with such gusto when we’re 82! At Prospect Harbor we’d reached the end of the Schoodic Scenic Byway, and we turned around to go back. Retracing our steps a little ways, we came across a huge field of wild lupines. 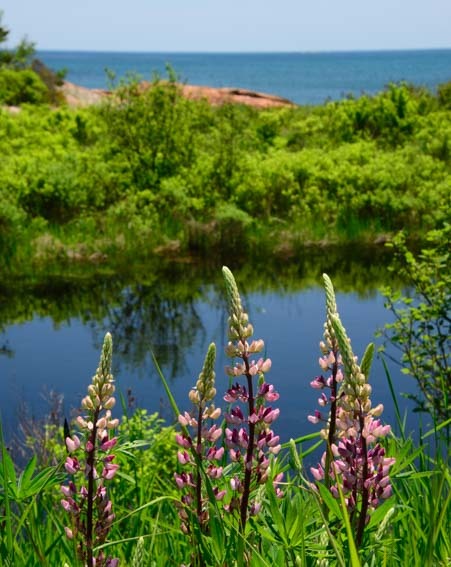 We learned later that these gorgeous flowers that blanket every corner of the coast in rich shades of purple, pink and blue are actually invasive in Maine. Admiring them and sitting among them, it was hard to imagine them having any kind of evil intent. Something that cheers up the countryside so much just can’t be called an invader. I think they should be called guests! 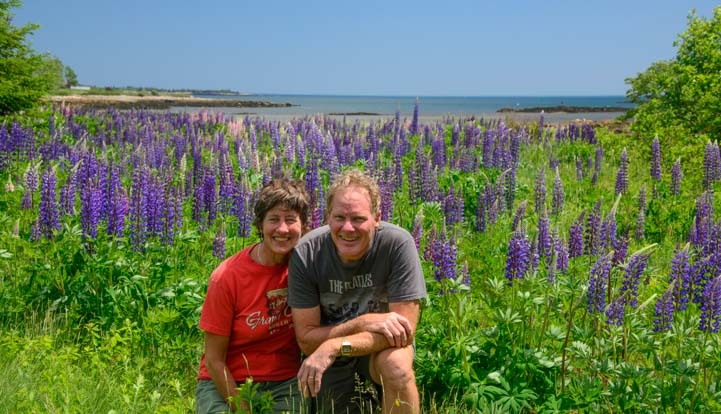 These big Maine lupines make wonderful company! 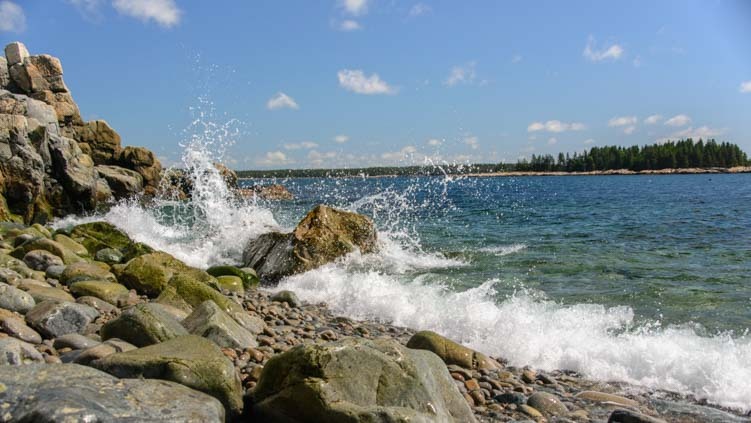 Further on, we took a slight detour off the Schoodic Scenic Byway and stopped at Grindstone Neck, a beautiful outcropping of vast granite slabs that stretch out to the sea just west of Winter Harbor. We romped across this rocky shoreline for a long time, exploring the nooks and crannies and tidepools along the way. A tidepool at Grindstone Neck. We finally tore ourselves away from the water and were just getting back in our truck when who should pull up but one of those adorable Ford Model A cars that was part of the big rally we’d seen back in Mt. Desert Island! Hey, it’s one of those Ford Model A’s!! We had no sooner gotten a pic of this pretty car posing for us when another one arrived and parked right next to it. Then suddenly two more came along and pulled in right alongside. How cool! What a handsome line up!! This beautiful sunny day was a real high point in our visit to Maine. 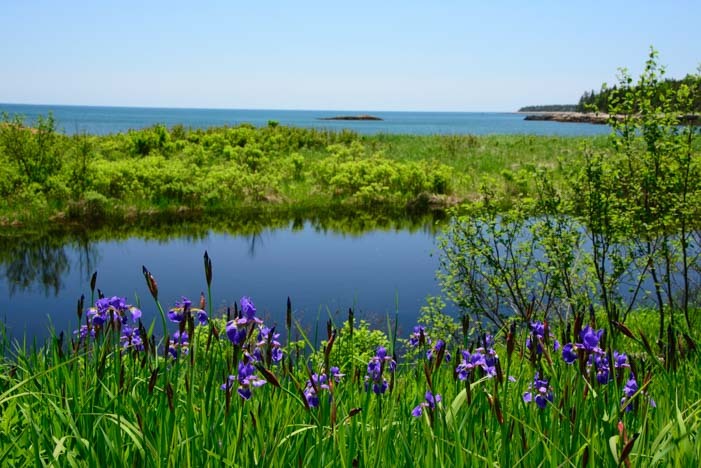 If you have an RV road trip planned to the northern coast of Maine, be sure to spend a day enjoying this wonderful drive. The route for the Schoodic National Scenic Byway begins on coastal Route 1 a little southeast of Ellsworth in the town of Hancock, and heads southeast from there. Even though you’re going southeast, though, technically you’re northbound on Route 1. It is New England, after all! After a few miles, turn right on Route 186 South and follow the coastline around Schoodic Point on up to Prospect Harbor. That is the official end of the drive, but continuing on to Corea is a special treat. Finish by looping back via Route 195 to Route 1, or turn around, as we did, and retrace your steps. See the map link below. 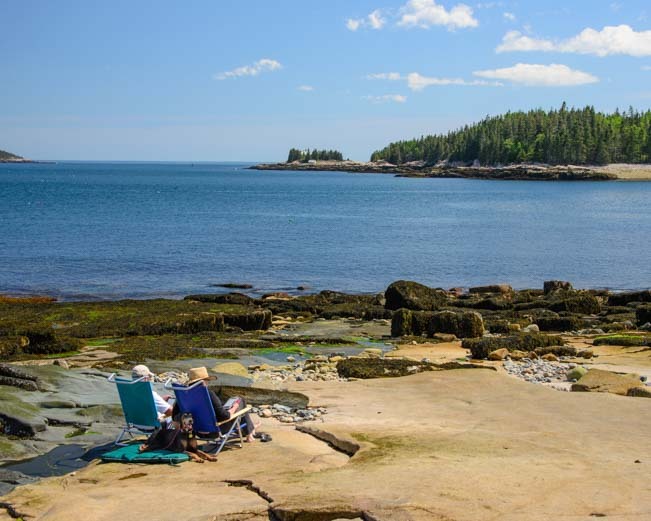 UPDATE: The new Schoodic Woods Campground managed by the National Park Service is opening on September 1, 2015. Here is a newspaper article about the opening. The land was donated by a family foundation. Undoubtedly the family name begins with the letter R, since that family has been extremely active and generous with their land holdings on Mt. Desert Island for nearly a century. 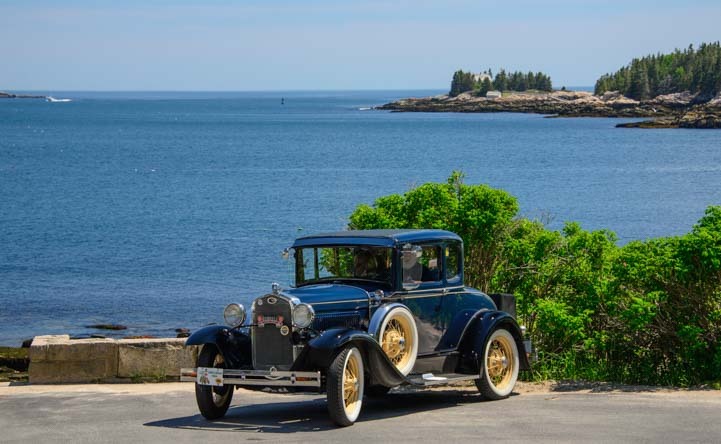 This entry was posted in Maine and tagged Downeast, Maine, New, Top Scenic Drives, Travel, USA, WP Travel by Roads Less Traveled. Bookmark the permalink. What a find 🙂 Loved the dog on his own beach blanket at Scenic Grindstone Neck…. It was a really fun drive…and he was one happy dog!! LOVE the Schoodic Peninsula. Been there done that. Enjoy! Thanks for sharing your photos. Definitely a place that’s worth of repeat visits!! Thanks so much for this informative article (and for your entire blog!). 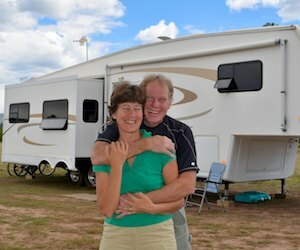 We are letting our trailer rest and renting a house in Goldsboro next week with our Daughter’s family, so your article on Scoodic and Acadia are very timely for us! Keep up the great stories! What perfect timing. Enjoy Goldsboro — what a spot to be in July!! And thanks for reading our blog. I’m from Bucksport and you hit the nail on the head about the genuine-ness of the downeast coast. I avoid Bar Harbor and Camden like the plague! Lucky you, Scott. What a great town to be from!! 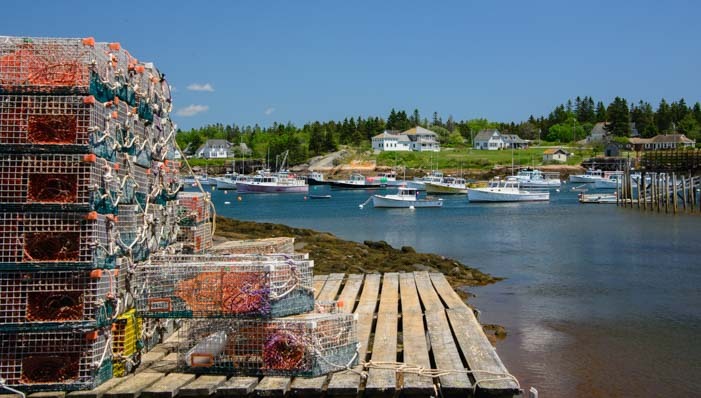 We absolutely loved our tour of downeast Maine along the coast from Acadia to Calais. Gorgeous — and can’t wait to come back! !